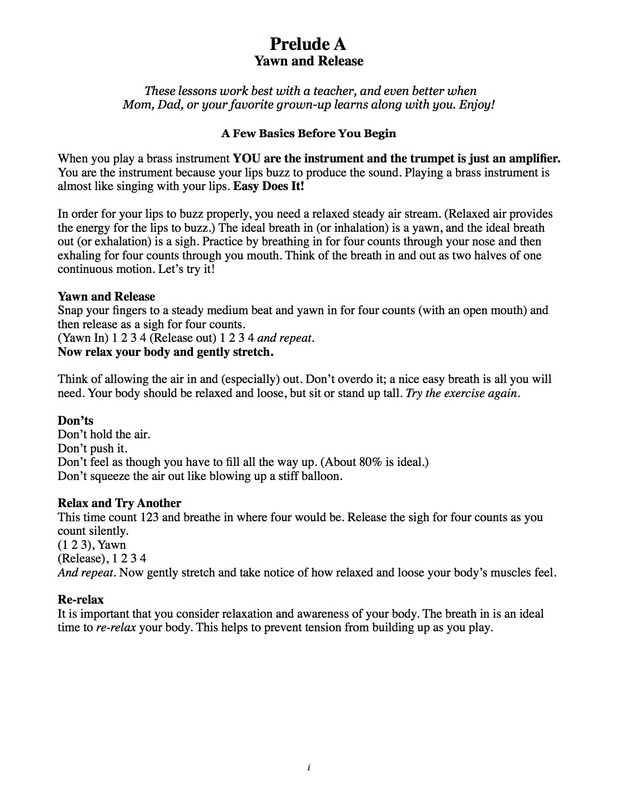 Don’t start brass at level 1, start a level ZERO! Why a pre-elementary book and not a standard elementary book? Almost every OTHER beginning method book is written for BAND, NOT BRASS! The first few notes matter. 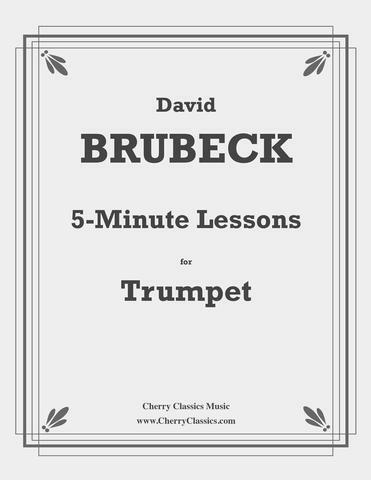 Purchase 5-Minute Lessons by David Brubeck from Cherry Classics. 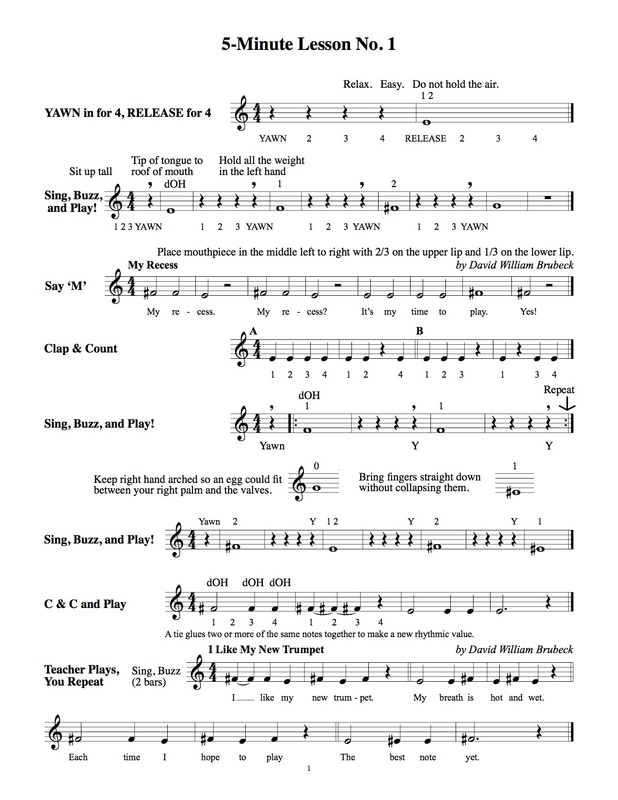 David Brubeck’s pre-elementary method for trumpet is written for young brass players by a great brass player. It has been presented at the International Trumpet Conference and featured in the Journal of The International Trumpet Guild. Whether you are heading for “Essential Elements”, “Standard In Excellence”, “Yamaha Band Student”, or even “Rubank’s Elementary Method”, start your your journey here! This 25 Page Method, includes six Pages of Fundamentals-(The ABC Preludes), 12 Lessons (5-Minute Lessons), AND additional pages of tunes, rhythms, scales, and even sight-reading all geared for the stone-cold, absolute beginner. Brubeck is perhaps the only musician to be featured as a soloist at the international conferences of the trumpet, trombone, euphonium, and tuba festivals! He graduated with distinction from Northwestern University where he received training from some of the foremost brass players in the Chicago Symphony, and was the first college musician named by Disney as a three-time All-American. A professional trombonist who performs regularly with the Miami City Ballet Orchestra, Brubeck has performed with the likes of Ray Charles, Stevie Wonder, and The Four Tops. Brubeck also has a lifetime of experience teaching young musicians at advanced levels having conducted the Florida Youth Orchestra and Greater Miami Youth Symphony for more than 25 years, and having studied with many of the finest music educators in the world such as Bennett Reimer and Arnold Jacobs. At the time of this writing, Brubeck has two former trumpet students on scholarship at the United States of America’s National School of the Arts-Interlochen Arts Academy, and two former students playing the Tommy Dorsey Chair in the Tommy Dorsey Orchestra, just to mention a few..